I know I should have liked this, but I didn't. I was bored, I couldn't connect with any characters, I couldn't get a glimpse of the setting, I read one long poem, and the most entertaining moment was Zoli losing a tooth--and that doesn't say much. I know there is a beauty in McCann's writing, but being this bored doesn't warrant more stars because of a history lesson or a unique love story. 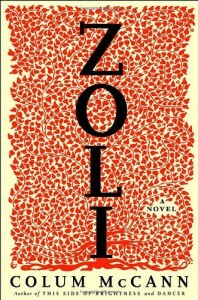 It's not that I'd never read this author again--I just had expectations of a more entertaining book about a lively gypsy culture, and found myself reading a quasi-true story in war torn countries giving the whole book a sense of melancholy even though I know parts of it were supposed to be animated. Better luck next time with this author...I hope.